Once the caries has reached the cavitary stage, the only treatment option left is to restore the lesion, because of the irreversible nature of the disease. Till yester years, cavities were made using GV Black's principles that dictate extension for prevention. This classical approach to treat dentinal lesions mandates removing all the infected and affected dentin. However today, there is paradigm shift in the manner in which the cavitated dentinal lesions are handled. With changes in the materials and restorative principles, the concept of 'Minimally Invasive Dentistry (MID)' has taken the lead. And, it is now well accepted to extend the cavities only to involve infected dentin and leaving the affected dentin as such. , However, while making cavities, it is usually difficult to know at what point caries excavation should be stopped, such as to involve only the infected dentin. This is due to the lack of valid clinical markers to differentiate between the infected and affected dentin. Recently a new fluorescence based camera system that works on the principle of Life D.T has been launched to aid caries detection and to guide cavity preparation [SoproLife (Sopro, La Ciotat, France)]. The camera captures the images in three different modes that is, daylight, diagnosis and treatment mode. Capturing in the day light provides a white light image with a magnification of more than 50 times than the tooth surface. The other two modes of the camera work on the principle of autofluorescence. In the diagnostic mode, the camera uses a visible blue light frequency (wavelength 450 nm) to illuminate the surface of the teeth, and provides an anatomic image overlay of the green fluorescence image on the "white light" image. This green fluorescence is considered as an indicator of healthy dental tissues; while carious lesions could be detected by variation in the auto fluorescence of its tissues in relation to a healthy area of the same tooth. In addition to the green fluorescence, red fluorescence may also be seen in some diagnostic mode images. This red fluorescence may represent deep dentinal caries; however, at the same time it might be a false signal coming from the organic deposits covering the tooth. Terrer E. et al. found a correlation between this red signal and organic deposits in the bottom of the groove. Hence, if a red fluorescent signal is encountered in the diagnostic mode images, it needs to be validated. For validation, the area showing the red fluorescence should be washed off with sodium bicarbonate or pumice, and if the fluorescence persists, then only it is considered to be representative of infected dentin. The fluorescence would no longer be there, if the source is simply the organic deposits on the tooth surface. The aim of this paper is to look upon the clinical applicability of the Life D.T concept for caries detection and excavation. Green fluorescence in the diagnostic mode of the camera is considered an indicator of healthy tooth and loss of green fluorescence (black green fluorescence) indicates infected dentin. This loss of green fluorescence is termed as 'Autofluorescence masking effect'. In the first patient, the caries in tooth # 36 was scored as International Caries Assessment and Detection System 3 (ICDAS 3) [Figure 1]a; however. The pictures taken with SoproLife camera did show an autofluorescence masking effect in the disto-occlusal aspect of the tooth [Figure 1]c, while only slight altered fluorescence was seen on the mesio-occlusal aspect [Figure 1]c. Using the Life D.T guidelines, this autofluorescence masking was indicative of deep dentinal caries. The caries was then excavated by the clinician who was blinded with the fluorescence signals. At the end of excavation, it was observed that a deep cavity had to be made in the Disto Occlusal aspect [Figure 1]d. Thus it might be concluded that "autofluorescence masking" effect can be used as an indicator to diagnose infected dentinal caries. Thus, aiming to achieve acid green fluorescence might be used as a guideline for termination of excavation process. This principle can only be applied when images are taken in the treatment mode. Terrer E. et al.. explained that in treatment mode images, sometimes red fluorescence may be seen at the end of excavation instead of acid green fluorescence, and this can be used as an indicator to differentiate between infected and affected dentin. If bright red fluorescence is seen during cavity making and the area is soft to excavate, it indicates infected dentin, while the in areas which are hard to excavate, it indicates affected dentin. Third patient in our series was scored as ICDAS 3 both in the mesial and distal pits in tooth # 26. 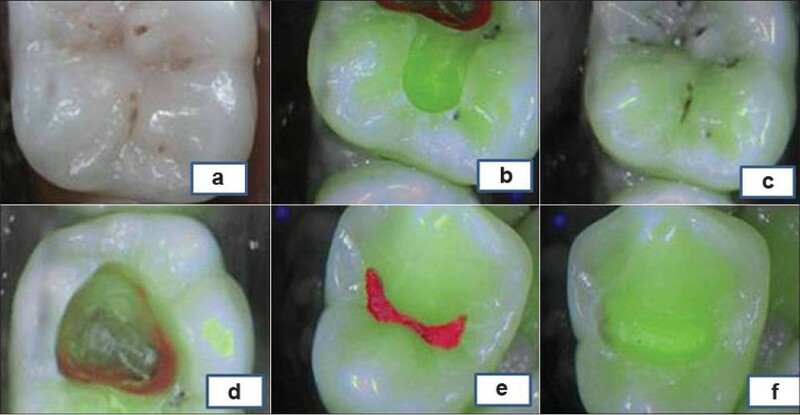 The diagnostic mode image showed red fluorescence in both the pits, which was validated even after washing with sodium bicarbonate, indicating infected dentin [Figure 2]a. During excavation, deep dentinal cavities was seen beneath both mesial and distal pits [Figure 2]b, and at the end of cavity preparation, the treatment mode images were captured, and bright red fluorescence was seen in both the pits [Figure 2]c. This bright red fluorescence indicates infected/affected dentin to be confirmed using manual excavator. Applying the Life DT principles, only the areas that were "soft to excavate" were regarded as infected areas, while the "hard to excavate" was left as such. Conclusively, these principles might be helpful in guiding the clinicians to detect initial caries, and also useful to guide caries excavation by differentiating between the infected and affected dentin. Our aim was to study the clinical applicability of Life D.T principles during caries excavation. The black green fluorescence (autofluorescence masking effect) was shown to be indicative of infected dentin while during cavity preparation, the bright red fluorescence was found to be indicative of infected/affected dentin. This junction was easily differentiated using a manual excavator and the areas which were hard to excavate, were left as such. Thus, different fluorescence signals were a helpful guide for caries detection and excavation. In vitro and in vivo studies are required both in unison and in comparison to other aids to validate the Life D.T concept. 1. Carounanidy U, Sathyanarayanan R. Dental caries: A complete changeover (Part III) - Changeover in treatment decisions and treatments. J Conserv Dent 2009;13:209-17. 2. Ericson D, Kidd E, McComb D, Mjör I, Noack MJ. Minimally Invasive Dentistry--concepts and techniques in cariology. Oral Health Prev Dent 2003;1:59-72. 3. Pai VS, Nadig RR, Jagadeesh T, Usha G, Karthik J, Sridhara K. Chemical analysis of dentin surfaces after Carisolv treatment. J Conserv Dent 2009;12:118-22. 4. Banerjee A, Watson TF, Kidd EA. Dentine caries excavation: A review of current clinical techniques. Br Dent J 2000;188:476-82. 5. Sato Y, Fusayama T. Removal of dentin by fuchsin staining. J Dent Res 1976;55:678-83. 6. Cederlund A, Lindskog S, Blomlöf J. Effect of a chemo-mechanical caries removal system (Carisolv) on dentin topography of non-carious dentin. Acta Odontol Scand 1999;57:185-9. 7. van de Rijke J. Use of dyes in cariology. Int Dent J 1991;41:111-6. 8. Carounanidy U, Sathyanarayanan R. Dental caries: A complete changeover (Part II)- Changeover in the diagnosis and prognosis. J Conserv Dent 2009;12:87-100. 9. Kidd EA, Joyston-Bechal S, Beighton D. The use of a caries detector dye during cavity preparation: A microbiological assessment. Br Dent J 1993;174:245-8. 10. Gurbuz T, Yilmaz Y, Sengul F. Performance of laser fluorescence for residual caries detection in primary teeth. Eur J Dent 2008;2:176-84. 11. Lennon AM, Buchalla W, Rassner B, Becker K, Attin T. Efficiency of 4 caries excavation methods compared. Oper Dent 2006;31:551-5. 12. Lennon AM, Attin T, Martens S, Buchalla W. Fluorescence-aided caries excavation, caries detector, and conventional caries excavation in primary teeth. Pediatr Dent 2009;31:316-9. 13. Terrer E, Koubi S, Dionne A, Weisrock G, Sarraquigne C, Mazuir A, et al. A new concept in restorative dentistry: Light-induced fluorescence evaluator for diagnosis and treatment. Part 1: Diagnosis and treatment of initial occlusal caries. J Contemp Dent Pract 2009;10:E086-94. 14. Terrer E, Raskin A, Koubi S, Dionne A, Weisrock G, Sarraquigne C, et al. A new concept in restorative dentistry: LIFEDT-light-induced fluorescence evaluator for diagnosis and treatment: Part 2 - treatment of dentinal caries. J Contemp Dent Pract 2010;11:E095-102. 15. Yip HK, Stevenson AG, Beeley JA. The specificity of caries detector dyes in cavity preparation. Br Dent J 1994;176:417-21. 16. McComb D. Caries-detector dyes--how accurate and useful are they? J Can Dent Assoc 2000;66:195-8. 17. Stahl J, Zandona A. Rationale and protocol for the treatment of non-cavitated smooth surface carious lesions. Gen Dent 2007;55:105-11. 18. Pandit I, Srivastava N, Gugnani N, Gupta M, Verma L. Various methods of caries removal in children: A comparative clin i cal study. J Indian Soc Pedod Prev Dent 2007;25:93-6. 19. Lennon A. Fluorescence-aided caries excavation compared to conventional method. Oper Dent 2003;28:341-5. 20. van der Veen MH, de Josselin de Jong E. Application of quantitative light-induced fluorescence for assessing early caries lesions. Monogr Oral Sci 2000;17:144-62. 21. Kleter G, Damen J, Buijs M, Ten Cate J. Modification of amino acid residues in carious dentin matrix. J Dent Res 1998;77:488-95.
erol, s. and kamak, h. and erten, h.
Tassery, H. and Levallois, B. and Terrer, E. and Manton, D.J. and Otsuki, M. and Koubi, S. and Gugnani, N. and Panayotov, I. and Jacquot, B. and Cuisinier, F. and Rechmann, P.
Alammari, M.R. and Smith, P.W. and De Josselin De Jong, E. and Higham, S.M.